"It is both strong and tough, which is a combination not usually found in nature," said Teng Li, the co-leader of the team and Samuel P. Langley Associate Professor of mechanical engineering at UMD's Clark School. His team measured the dense wood's mechanical properties. "It is as strong as steel, but six times lighter. It takes 10 times more energy to fracture than natural wood. It can even be bent and molded at the beginning of the process." "Soft woods like pine or balsa, which grow fast and are more environmentally friendly, could replace slower-growing but denser woods like teak in furniture or buildings," Hu said. "The paper provides a highly promising route to the design of lightweight, high performance structural materials, with tremendous potential for a broad range of applications where high strength, large toughness and superior ballistic resistance are desired, " said Huajian Gao, a professor at Brown University who was not involved in the study. "It is particularly exciting to note that the method is versatile for various species of wood and fairly easy to implement." "The two-step process reported in this paper achieves exceptionally high strength, much beyond what [is] reported in the literature," said Zhigang Suo, a professor of mechanics and materials at Harvard University, also not involved with the study. "Given the abundance of wood, as well as other cellulose-rich plants, this paper inspires imagination." "The most outstanding observation, in my view, is the existence of a limiting concentration of lignin, the glue between wood cells, to maximize the mechanical performance of the densified wood. Too little or too much removal lower the strength compared to a maximum value achieved at intermediate or partial lignin removal. This reveals the subtle balance between hydrogen bonding and the adhesion imparted by such polyphenolic compound. Moreover, of outstanding interest, is the fact that that wood densification leads to both, increased strength and toughness, two properties that usually offset each other," said Orlando J. Rojas, a professor at Aalto University in Finland. 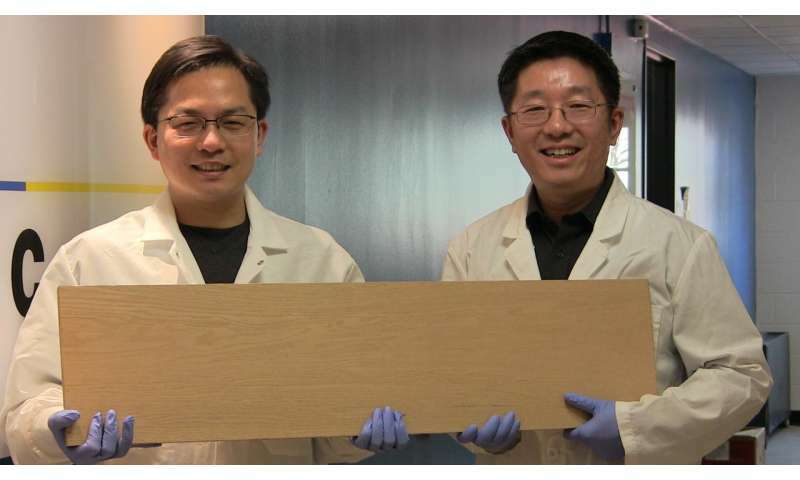 Hu's research has explored the capacities of wood's natural nanotechnology. They previously made a range of emerging technologies out of nanocellulose related materials: (1) super clear paper for replacing plastic; (2) photonic paper for improving solar cell efficiency by 30%; (3) a battery and a supercapacitor out of wood; (4) a battery from a leaf; (5) transparent wood for energy efficient buildings; (6) solar water desalination for drinking and specifically filtering out toxic dyes. These wood-based emerging technologies are being commercialized through a UMD spinoff company, Inventwood LLC. All singing and dancing material. Hope it is feasible, as this would be a monumental industry disrupter. Right next to Cold Fusion. So, No More Wild Fires. GOOD. AND Prof.Hu Ptches TRANSPARENT WOOD (Like Plastic) ! The second sentence in this article should have been: "Their two-step process involved the partial removal of lignin and hemicellulose from the natural wood via a boiling process in an aqueous mixture of NaOH and Na2SO3 followed by hot-pressing, leading to the total collapse of cell walls and the complete densification of the natural wood with highly aligned cellulose nanofibres." Oh Turgent, I sure hope this does not turn out to be an outright crank fraud like cold fusion! My interpretation of the event that received the misnomer of Cold Fusion. Was a random weak nuclear decay that was fortuitously observed. Assumptions were leaped upon pellmell and a whole lot of bombastic speechafying ensued. T, got any of your experiments to work yet? Or, are those Men In Whitecoats preventing you from inventing your own cold fusion gizmo? What was observed was a one in a umpteenillion years of half-life. Now don't ever take your eyes off your testbed! Cause it could happen again at any uncertainly random time. Using high temp superconductors and laser amplifiers my perpetual motion machines are proving to be an energy source. Top Secret though. T, when you achieve an Apergy reaction? Please be sure to notify the rest of us.